I ducked out to the farm recently (about 40kms north of Roma, Queensland), it was a beautiful early morning trip to check on the cattle, see how the grass was growing after the beautiful rain we had received and to see how our flood gates were holding up. Flood gates are the fences we put across the creeks or gullies, that in large flows generally unhook on one side and swing across to the other side in the current so that it is in the same direction as the flow of the water. This way any large logs or debris that may come down the creek don’t get caught and tangled in the fence, ripping it completely out. After the high water recedes, we head down and pull the fencing back across the creek, bang the posts back in, and fix up the wire (if required). This then stops the cattle getting through to an area they are not supposed to be once again. Not so bad in summer. Can be a little cold in winter if there is still a bit of water in the bottom when we put the fence back up. On this particular day, I couldn’t get too far, as the creek still had a bit of a run through it and if I got stuck I would be there for a little while as help would take a while a reach me. 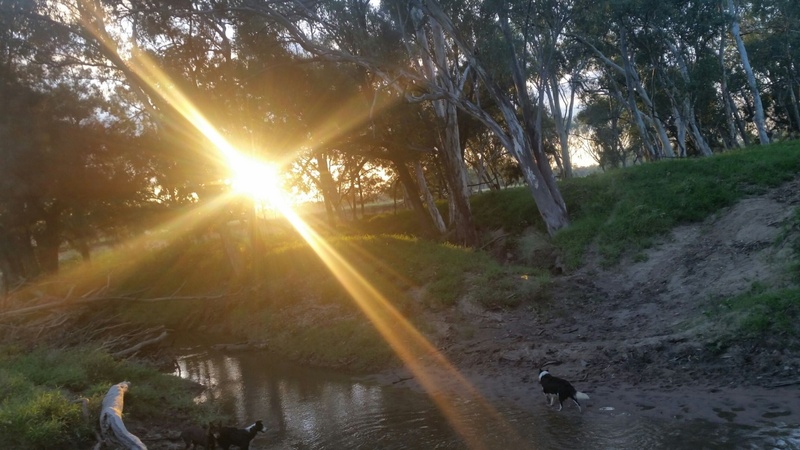 So instead I gave the dogs a swim, fought off a number of mozzies that had bred after the last few rainfalls and took the lovely photo of the rising sun shining through the tree limbs. On the other side of the creek I could see a calf racing around, enjoying the morning warmth, and trying to encourage a few of his mates to participate in his games. The grass is definitely green and growing. A beautiful morning to be out and about. It wasn’t that long ago that the weather was quite hot and dry and we only had a little bit of rain to start to green things up. 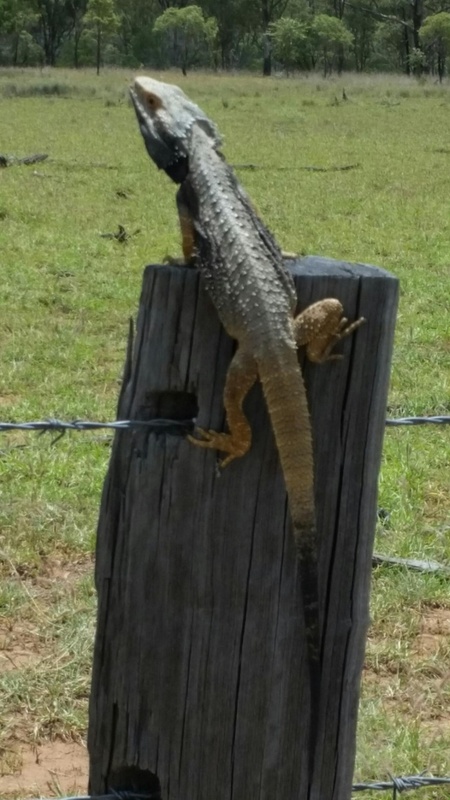 This fellow was on a post near our front gate. He was trying to stay as still as possible, hoping I wouldn’t see him. While his tail blends in reasonably well, the rest of this Eastern Bearded Dragon stood out like a sore thumb. They can change their colours with temperature – into different shades of yellow, black and grey. Maybe he was more worried about soaking up the sun this day. To tell whether they are male of female you need to check their belly. Males have a pattern of circles underneath. Females have a plain light grey belly. Eastern Bearded Dragons eat insects, spiders, leaves, daisies and other flowers. They are quite approachable – the worst they’ll do if you get too close is puff up, open their mouth and make themselves look scarier! You can see many of these guys out here in Outback Queensland, and on any one of our Ecotours we run.